Meet Lauren, Who What Wear's fashion editor and co-founder of The Devils Wear Zara. Lauren is so obsessed with Zara that we started calling her The Zara Scout. Now she's turning the nickname into a franchise so she can regularly share her insider knowledge of the brand, including all her hacks, secrets and must-haves with you. Amid the crazy time that is the Zara seasonal sale, there is a lot to sift through. With never-ending pages of marked-down products to scroll through, it seems nearly impossible to create organisation among the chaos and panic this sale instills. While I was personally shopping the much-anticipated sale, I thought to myself, Am I saving the most money possible while adding dozens of items to my basket? Will these pieces be further reduced? Overall, I was curious to know the best ways to save money while shopping at Zara, sale or no sale. Although I consider myself a Zara expert, this was an investigation that needed to be outsourced. So, who did I turn to for the insider secrets on saving the most money while shopping the brand? Zara employees, of course. Thanks to the trusty followers of The Devils Wear Zara, I got more than enough intel on the best ways to spare a pound at the fast-fashion retailer. 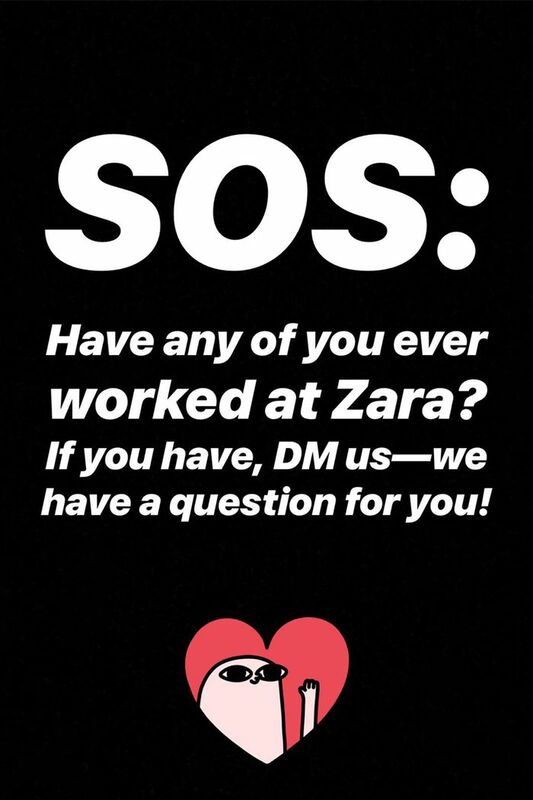 I put out a blast on our Instagram Stories for anyone who has ever worked at Zara to DM us so we could pick their brains, and much to our surprise, over 123 people responded… 123! After reading all the messages thoroughly, I'd learned so much that I couldn't not share the tips and tricks with you. Below, I chose the quotes that stood out to me the most and were repeated the most from both former and current Zara employees. Here, prepare to learn all the ins and outs of shopping not only the sale but the brand in general, including which pieces you should never splurge on, which day sale markdowns happen and ways to score the pieces you've been eyeing most. Ready for the top-secret information on how to get the most without spending the most at Zara, according to Zara employees? "The biggest sign that a sale is coming is when the clothing gets all turned horizontally and packed onto the racks. Usually, the merchandisers are grouping together everything by the same price point and will have as much inventory on the floor as possible. This basically means don't buy anything because in a couple of days it will all be on sale." "Right before Zara starts their sale they try to sell everything at regular pricing. You'll see most of the old collections back in stores and only the new clothing is labeled with signs that say 'new collection'. So I would recommend not buying those older clothes because they will be on sale two weeks later." "Summer sales are around the end of June and winter sales start in December, and then the Black Friday sale, of course." "The first week of the sale, we are most likely going to discount 10% to 25%. The second week, we price the sale at 40% or even 50%. During the third week, you can get items for up to 70% to 75% off because everything has to go. It's better to wait two to three weeks for the best sale prices." "Wait for discounts on more expensive and larger pieces such as coats and jackets. Use the first round of discounts to buy those pieces you've been watching for a while, and then go shopping a few more times because the discount gets only bigger during those three weeks." "Save the link of the product you want, even if its sold out—they always restock. This is very useful during sales because you can get literally anything. During sale season, there are a lot of returns, and as soon as something gets back to the warehouse, the stock is refreshed, and if you're quick enough, you can get that T-shirt for half price or even more discounted." "Basics like trench coats, puffers, denim, plain sweaters and cardigans, camisoles—things like that—they remake every year, so we (Zara employees) would always buy those on sale and no one would know it was from the previous season." "Never buy shoes you don't really need from new season because they'll come back for half the price during the sale." "There are a few special price reductions every now and then—usually pieces that were meant to sell but didn't. You never know when this will happen nor which pieces it will be, so keep an eye out." "Over the years, I learned that articles of clothing from the women's section are usually pricier but better quality. So when you invest a few more pounds in jeans, they will usually last longer. I would invest in women's pieces for items you want to keep longer and in TRF or basic items for items you expect to only wear for a season or two." "Buy all your basics in TRF. They're super inexpensive and still good quality." "Zara is obviously the cheapest in Spain and Portugal since most of it is produced there. So stock up whenever you find yourself in those countries!" "If you are on the petite side, consider shopping in the kids' section. Zara kids clothes run really big, as do the shoes. As of right now, the kids' department is trying to mirror the women's and men's, so everything in kids' is super trendy." "Price reductions on items that carry over from one season to the next also do happen frequently, mostly on basics such as knitwear, jeans and shirts. It won't necessarily be marketed as 'sale', so keep your eye out around those transition times of the year just in case." "Special pieces like a statement summer dress or coat that stand out from the rest of the products are probably only available in limited quantity and won't be reproduced for sale, so definitely grab it." "Become friends with employees so you can receive their 25% off employee discount, even on top of whatever sale is going on."